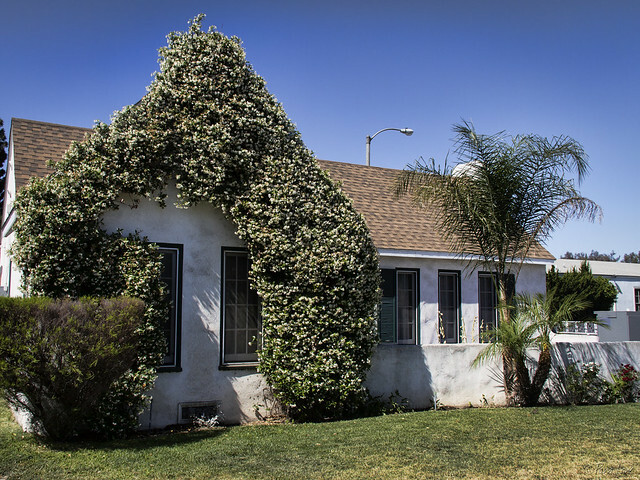 It was a couple of weeks ago that I first noticed this house covered with star jasmine blooms. But it was only this morning that I made it by there in the morning to catch the sun on the flowers. According to Wikipedia, the star jasmine "...is widely planted in California... It gets another of its common names, "trader's compass", from an old Uzbekistan saying that it pointed traders in the right direction, provided they were of good character." But the best thing about being surrounded by all this jasmine is the scent. "Jasmine is just the most delicate and beautiful scent."